The Masters Elite descend the flyover. The MABRA Cyclocross Series dropped in on Chris and Fred Kelley October 4, 2009, to play in their backyard. Talk about a scene that would have driven my grandfather crazy, all those kids with their bikes on his property! 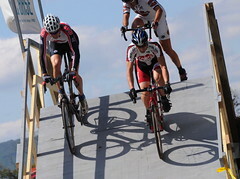 Kelley Acres ‘Cross featured lots of climbing, ridable barriers, and a Euro-style flyover. It was a great day in the country for cross racing. We caught up with some of those on the podium to see how the day went. Thanks for reading.